A yacht race over the weekend at the Farallon Islands ended in tragedy on Sunday. One sailor was killed and four people are missing. The San Francisco Bay area’s sailing community that is tightly knit is reeling from the tragedy. Waves as high as 12 feet, fueled by high winds pummeled a sailboat in the Full Crew Race, while hurling the boat into the rocks around the islands. Most of the crew was sent overboard by the waves. Three of the crew were rescued however, Marc Kasanin of Belvedere was found dead in the waters around the islands. Four other crewmembers disappeared. The choppy waters around the islands were scoured by the National Guard and Coast Guard. 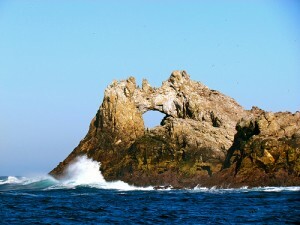 The Farallon Islands are located about 27 miles from the Golden Gate Bridge. The search for the missing was called off late Sunday and no plans had been made for it to resume. Many members of the San Francisco Yacht Club could be seen weeping at its offices in Belvedere. A number of them left white roses and candles at the entrance to the club. One of the members of the club said family and friends of the dead and missing were in complete shock, but took the time to thank everyone for all their support. The sailboat that crashed was a 38-foot craft named Low Speed Chase. It was one of nearly fifty boats that competed in the contest, which began on Saturday in San Francisco. On Saturday, a number of boats decided to turnaround due to 25-knots winds that created waves as high as 15 feet around the islands.